Yamaha Motor Co., Ltd. Is the Japanese company offering some of the best sports bikes, cruisers and off-road bikes on the market? Yamaha has been focusing mainly on their scooter models as two-wheelers play a vital role in common man's life. Fascino is Yamaha India's millionth scooter and it rolled out from its Surajpur plant, located near Greater Noida on Friday, August 12, 2016. The Yamaha Fascino is the most premium scooter from the Japanese motorcycle company. Yamaha Fascino is quite an elegant looking scooter with an attractive front design. There is a small cubbyhole near the key fob which can be used to store mobile phones or things like a small water bottle for the comfort of the rider. The soft and large seat is 7mm thinner around the edges to help the rider's feet reach the ground with ease. Pillion has enough room, propped foldable footrest and useable grab rails. At the front of the Yamaha Fascino has been given a retro design treatment with the smooth flowing line. The scooter looks elegant with an attractive front design. It gets a distinct chrome front grille and old school rear view mirrors in chrome finish along with unique triangular headlight. At the backlight of the scooter, there is a mix of matte black plastic and glass bits which looks very trendy and in between sits the chrome highlight with a small Yamaha tuning fork 3D logo enhance the beauty of this ride. The sharp tear shaped tailpiece along with the sleek and long exhaust reminds of the Batmobile, attract the rider along with the retro analog instrument console with speedometer and fuel gauge. The Fascino is available in three solid colors- white, cyan along with four dual tone colors. These include white with black, red with black, and cyan with black. Fascino is based on the same platform of Yamaha cycles with telescopic front forks and single rear shock absorber mounted on the left side. Yamaha Fascino has carved out a fairly large 380mm wide and 220mm long footboard, which makes a way for decent leg room. This long scooter with a wheelbase of 1,270mm, but the 128mm ground clearance definitely isn't the best in the segment. The Yamaha Fascino is the lightest of all the Yamaha scooters, with a weight around 103 kg. 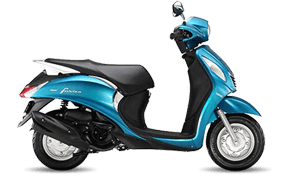 the Yamaha Fascino runs on basic 10-inch wheels with MRF Zapper tyres and 113cc air-cooled, 4 strokes, single-cylinder Blue Core engine technology helps to reduce engine friction. The Fascino gets 130m drum brakes for both ends and a 5.2-litre fuel tank capacity. The Fascino has one of the most refined engines in the scooter segment of India, though it's also one of the least powerful and it is not heavy as compared to other scooters. Hence riders enjoy this ride. If your motorbike is insured under the Two Wheeler Insurance policy than a loss or damage to your motorbike because of the natural calamities like earthquake, flood, cyclone or landslide will be compensated. If the insured vehicle suffers from any damage or loss because of man-made disasters and actions like burglary, strikes, accident by any external factor will be covered under the Two Wheeler Insurance policy. Any damage caused to a vehicle due to man made a dangerous activity like terrorist activity will be compensated under the Two Wheeler Insurance policy. The Two-wheeler Insurance covers the policyholder against the legal liability due to accidental damage that results in the permanent injury or death of the respected person. Under the Two-wheeler Insurance policy, a Personal Accident Cover is provided for the individual driver of the insured vehicle in case of mounting or dismounting from the two-wheeler. One can opt for a plan for the safety of the fellow passenger.